from the Immune System InSide > Out ! WHAT is Doggy GOO ™ ? A premium Canine Immune System Health Supplement focused on promoting the Health & Response of your Dog’s Immune System. Simultaneously Targets, Supports & Balances the Innate, Acquired & GUT Tiers of your Dog’s Immune System. 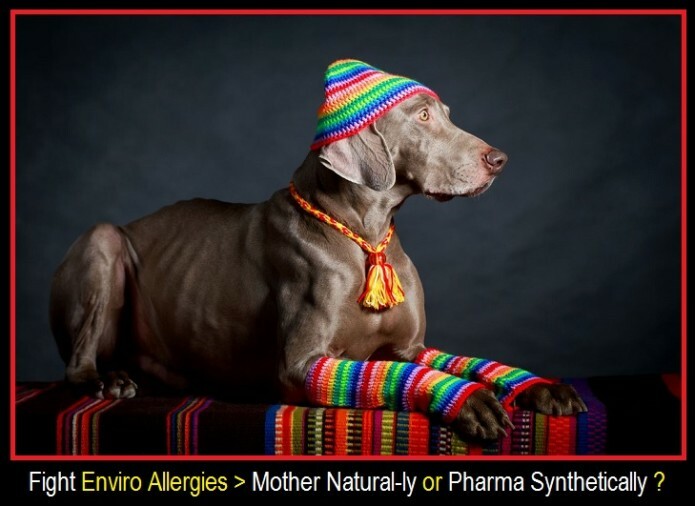 Doggy GOO’s methodology builds Immune Tolerance to everyday Environmental Allergy Sources. WHY Doggy GOO ™ ? For Puppies or Young Dogs ( Pre 9 mo.) who may be Genetically PreDisposed to Allergy. Or for Puppies whose Pet Parents wish to take PreEmptive Measures against possibility of Allergy Disease Onset. 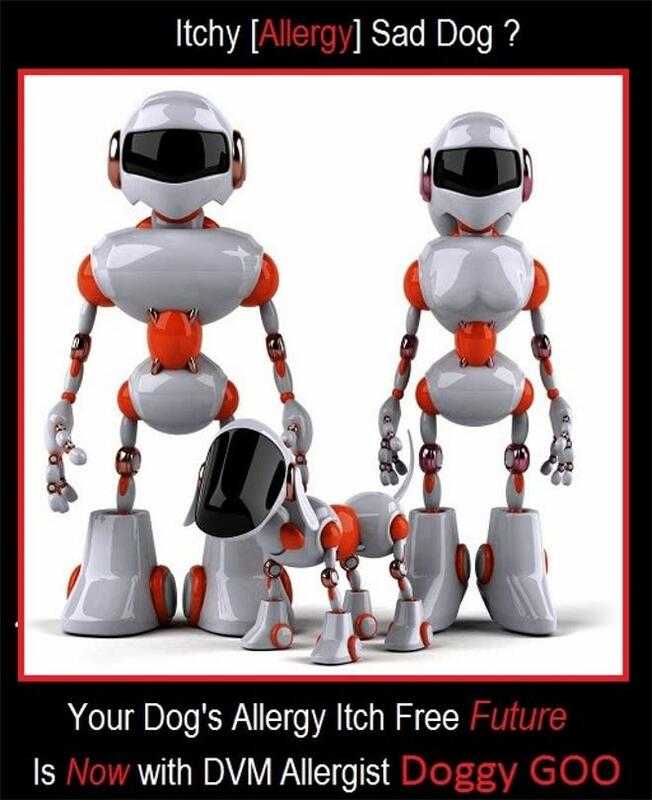 Doggy GOO Pre-Emptively builds Immune Tolerance to Enviro Allergens before Allergy has a chance to become Entrenched and Progress. 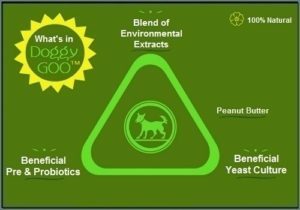 Doggy GOO’s 100% Natural Ingredient Groups. 1st Line of Immune Defense = Innate Tier. A complex Nutritional Fermentation Product derived from what is commonly known as Brewer’s Yeast. The Yeast undergoes a proprietary Fermentation / Drying Process that produces Nutritional Metabolites containing Vitamins, Minerals, Amino Acids and Antioxidants. Clinically shown to Support & Balance Innate Tier Immune Response. Healthy GOO ™ has selected Saccharomyces Cerevisiae Yeast as a Primary Ingredient because it delivers proven, Healthy GOO Glow ™ Power to Defend ™ > Immune System Health Results Naturally! Saccharomyces Cerevisiae Yeast is a dried, complex fermentation product comprised of beneficial metabolites, proteins, peptides, amino acids, vitamins, minerals, antioxidants, polyphenols, organic acids, beta-glucans and mannans, all designed to support robust digestive health by balancing gut microbiota, gut morphology and animal immune response. Healthy GOO’s ™ Saccharomyces Cerevisiae Yeast not only naturally engages the body’s 1st Line Immune Defenses with the correct response to a wide range of challenges depending on the need, but it also works together, with the other facets of your Pet’s Immune System toward optimal Support and Health Harmonization. Enhances 1st Line of (Innate) Immune System Defense by supporting the Mucosal Barrier. Provides Anti-Inflammatory Benefits by continuously scavenging and removing dangerous Free Radicals through High Anti-Oxidant Activity. Helps Optimize a high Level of Natural Resistance to Infectious Disease by balancing the Body’s reaction to Pathogens and Allergens as well as helping the Body Suppress an Over-Active Immune Response. GOO Proprietary Blend of 15 Protein Concentrates from Enviro Allergy Sources. Builds Immune Tolerance in “Intelligent” Acquired Immune Tier: Ability to Recognize / Respond / Remember. Protein extracts from Allergy producing Trees, Weeds, Grasses, Mites, Mold Spores. GOO’s Methodology Clinically Shown to be Equivalent to Immuno-Allergy SHOTs in neutralization of Dust Mite Allergy in Canines. GOO builds Immune System Tolerance to Qty 3 Grass, 1 Tree, 4 Weed Pollens, 2 Dust Mite, 2 Food Mite and 3 Mold Allergy Sources. Every day, your Dog is exposed to a limitless number of Environmental Elements, which may or may not be harmful to their Health. It is up to your Pet’s Immune System to sort out the Harmless from the Harmful and to know when to pass on the harmless, and go into defense and protective action against what it deems as harmful. It is this ongoing struggle which demands that the health of your dog’s immune system be in tip top shape. While the above Saccharomyces Cerevisiae Yeast ingredient group of Doggy GOO ™ has been chosen because it Targets, Supports and Balances the Primary (Innate) Tier of your Pet’s Immune System, there is another Immune Tier called the Acquired Tier. The Acquired Tier works in sequence with the Innate Tier and basically handles what gets past this first line of Innate Immune Defense. The Acquired Tier has the ability to not only recognize, attack and destroy harmful transgressors, but it also has the unique ability to remember. It is this memory characteristic, which allows your Acquired Tier to not only recognize and respond quickly to similar future attackers, but also to create and present the most effective method of their destruction (i.e. antibodies). 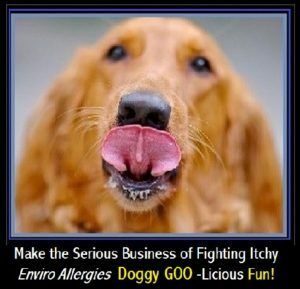 Recognizing and understanding the dynamics of the misguided Immunological Response, and wishing to address and correct this Imbalance, Healthy GOO’s ™ Medical / Veterinary Dermatologist / Allergist Consultant, has carefully chosen a proprietary blend of 100% Natural Environmental Concentrates to be included in Doggy GOO ™. This Blend of Environmental Extracts not only represents many of the common Elements found in your Dog’s Environment, but also represents the major Environmental Sources to which Canine Immune Systems have been found to often inappropriately identify as Harmful. It is through the daily exposure i.e. Lick / Lick / Lick, in small amounts, of these Doggy GOO ™ Environmentals that the natural ability of the Adaptive Tier of your Dog’s Immune System can begin to build Tolerance to these Sources. Over Time, the use of Doggy GOO ™ allows your Dog’s Immune System to rely on its natural inherent recuperative abilities to Re-Adaptive / ReTrain itself, such that harmful triggering Environmental Sources are turned into Harmless, negating the Immune System’s subsequent “Attack Mode” response, thereby mitigating the resulting Allergy Symptoms and improving the Health and Quality of Life for Beast and Man. ProBiotics promote and maintain GUT Tier Immune Health & Response. Protective Probiotic Spore survives Heat, Shelf Life variables and the Acid and Bile Challenges of Animals Digestive System. Protective Spores enable Survivability to Germinate and Produce Good GUT Bacteria where it can do it’s beneficial work. BACILLUS COAGULANS, while sounding foreign, almost alien, BACILLUS COAGULANS or BC30 as it is also referred, is a species of beneficial bacteria, or Probiotics which helps restore and maintain your Pet’s Natural Intestinal Function and beneficial bacteria balance. Doggy GOO’s BC30 is a Gram-Positive Spore-Forming Bacterium which, once germinated, produces L+ lactic acid, supporting good bacteria in the gut, displacing non-beneficial bacteria. BC30 is manufactured in the U.S.A. in an FDA-certified cGMP (current Good Manufacturing Practices), kosher pharmaceutical facility, using only the purest, and pharmaceutical grade ingredients. Each batch is DNA-tested for ingredient purity, quality, and CFU concentration to ensure uniformity. It has also been accepted for use by the U.S. FDA Center for Veterinary Medicine.BC30 has many inherent Physical and Probiotic Properties that make it superior to other traditional Probiotic organisms such as Lactobacillus, Acidophilus and Bifidobacteria. All of which is WHY Healthy GOO is proud to include Probiotic BC30 in its Doggy GOO formulation to address the Gut Health Facet of your Dog’s Immune System. Healthy GOO / Doggy GOO’s BC30 Probiotic > As Tough as “Your” Dog! As mentioned previously, before a probiotic can confer its beneficial gut health benefits to its host, a probiotic has to be tough enough to survive. Don’t forget that Doggy GOO’s BC30 is a live bacterial microorganism, which cannot work its immune system, gut health magic if it’s dead on arrival! It has to survive its journey from the biotech point of manufacture through processing, shipment, inclusion into Doggy GOO, to your refrigerator and ultimately all the way down your dog’s gullet. Then it has to make its way through the harsh, hostile environment of your dog’s stomach and finally into your dog’s small and large intestines, where then it can begin to grow and colonize and work its probiotic magic. Here is where Doggy GOO’s BC30 has the Survival Edge; it has a Protective Shell! Doggy GOO’s BC30 is just like your dog, tough on the outside, but with a CFU gut health producing soft probiotic inside. You see, BC30 is a spore-forming probiotic bacterium, which means that has a natural, hardened protective shell. Similar to a seed, a spore forming bacterium has a hard outer covering that protects the fragile cell within. This natural shield safeguards and defends the cell’s genetic material from the heat and pressure of manufacturing processes, challenges of shelf life and the acid and bile that it is exposed to during transit to the digestive system. Once it is safely inside the small intestine, the viable spore is then released and able to germinate and produce new vegetative cells or good bacteria. Other traditional probiotic organisms, such as lactobacillus, acidophilus and bifidobacteria are not able to form these defensive spores, making them vulnerable to heat, pressure, shelf life variables and the acid and bile challenges of the digestive system. It is this hearty spore-forming nature of Doggy GOO’s BC30, which provides superior viability and excellent stability, together with the “Good Bacteria” health benefits that it confers, that make BC30 Doggy GOO’s ideal probiotic choice, compared to other probiotic bacteria strains, such as lactobacillus, acidophilus and bifidobacteria. So our BC30 has survived its tumultuous journey to your Dog’s Intestine’s now what? Here is where Doggy GOO’s BC30 really works its health magic! Doggy GOO’s BC30 has been shown to help support / increase the immune system’s response to viral challenge. Doggy GOO’s BC30 has been shown to help support / increase the immune system’s response to various pathogens. Doggy GOO’s BC30 regulates the digestive system by successfully colonizing the intestines. Doggy GOO’s BC30 maintains the balance between good and bad gut bacteria. Doggy GOO’s BC30 improves / regulates digestive health by successfully colonizing the intestines and producing lactic acid. Doggy GOO’s BC30 improves the breakdown of nutrients for better absorption. Doggy GOO’s BC30 displaces undesirable bacteria in the gut. The “ GOO” in Doggy GOO = 100% Mother Natural Peanut Butter w/ Flax Seed Oil. Healthy GOO believes that the Best Drug / Supplement / Therapy in the World is UseLess > “If” the Patient is Non-Complaint ! By making Fighting Itchy Canine Allergies a GOO-Licious Peanut Butter Treat, “Canine” GOO Compliance is Guaranteed i.e. Dog’s Luv Peanut Butter !, and “Pet Parent Compliance is Guaranteed, because Your Dog will always “Remind You” that it is Time for GOO ! A 100% Natural GOO-Licious Healthy Treat for your Dog. GOO Immune Health is easy for Pet and Pet Parent. Doggy GOO uses 100% Natural Peanut Butter. Natural Peanut Butter with Flax Seed Oil. When Healthy GOO set out to find a healthy ingredient group for its Doggy GOO, it not only want to find something that complimented the other ingredient groups but also set for itself a challenge of gargantuan proportions, namely dogs had to thoroughly enjoy, devour and lick whatever Ingredient was chosen. After much consternation, multiple dead ends, frustrating discussions with food scientists with ingredient formulations that had more letters in them than 10 alphabets combined, it was determined that the Answer to our quest, was not some exotic scientific concoction, but, good old-fashion, healthy and dog tasty, peanut butter!The choice of Peanut Butter many be considered a No Brainer by many dog owners, and Healthy GOO was a little embarrassed that it felt the need to seek out a complex, scientific solution to match its other scientific and complex Doggy GOO ingredients. All that time, the solution was literally right in front of our mouths! The choice of the actual type and manufacturer of Peanut Butter actually posed the more difficult challenge.You see, in the world of Peanut Butter; a Peanut Butter is not just a Peanut Butter. What we mean is that there is a spectrum of Peanut Butter from Peanut Butter Spread which contains less than 90% peanuts, to Peanut Butter which contains at least 90% peanuts, to 100% Nut Butter which is made of 100% peanuts. Even within these classifications, you have multiple sources of varying quality and manufacturer integrity. Many Pet Owners are Pro-Active Health Consumers for Themselves, their Family, and for their Dog ! They try to Eat right, Exercise, get plenty of Sleep, and seek the Tranquility of Nature, be it a Wooded Forest, a Grassy Field, a Sandy Beach or a Tree-Lined Park. Pet Owners are also proactive medical consumers. They have long realized that ProActive or PreEmptive Medical Measures not only hold the Key to early Disease Identification and Treatment, but also play a Major Role in Fending Off the Slippery Slope Progression of many Diseases. For Proactive Health and Medical Consumers and Pet Owners, the saying “You are what you Eat” is more than a cute saying; it is a Mantra and the Central Belief Strategy to a Long Life of positive Physical and Mental Health. This “You are what You Eat” Vigilance, not only applies to the Foods that Pet Parents eat everyday but also to what they give their pets. Pet Parents more than ever before are no longer going by the fancy front Label of their Pet’s Food or Supplement Products, but rather to the Ingredient Label to see and judge for themselves. They are concerned with not only what is inside the Container, but ultimately what may go inside their Pet as well. They closely scrutinize every ingredient and determine whether or not it stacks up to the high ingredient standards they have set for their pet. Healthy GOO subscribes to these very standards and has taken the very same ProActive Health and Medical Measures in its choice of Ingredients. Each Doggy GOO Ingredient Group has been painstakingly chosen by Healthy GOO Medical & Veterinary Dermatologist / Allergist Consultant, to help your Dog’s Immune System Function at an Optimal Level so it can more Successfully Fight off all kinds of (Enviro Allergy) Health Aggressors. Please take a moment to Review what we have to say about each of our Doggy GOO Ingredient Groups. They have been chosen to Target as well as Naturally Support and Balance the Innate and Acquired Tiers of your Dog’s Immune System, Support Healthy Gut Function, as well as to Help your Dog develop normal Immune Tolerance to Allergy Elements in its Everyday Environment. It is our Hope that after your Review our Ingredient List, You will find that our Ingredients not only Mirror the High, natural Standards that You hold for Yourself, but also for your Pet. Promotes Immune System Balance & Health Defenses. Medical Science applied to your Pet’s Life! Formulated by Healthy GOO’s Medical Veterinary Dermatologist / Allergist Consultant. Supports Healthy 1st Line Immune Defenses and Responses. 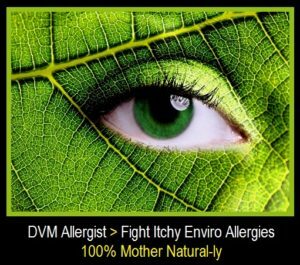 All Natural Extracts build everyday Immune System Tolerance to omnipresent Environmental Pollens, Mites and Mold Sources. Delivers Prebiotic & Probiotic Gut Bacteria and Digestive Tract Health. Health, Wellness and Vitality achieved 100% GOO Mother Naturally ™. A Canine Immune System Health Supplement that is also a GOO-Licious Peanut Butter Treat!